In the nursery we have a hard time keeping these in stock. Lynn-Marie keeps propogating, but nevertheless we keep running out. It's understandable. They're deservedly popular. So... here's Echeveria 'Tippy' ... again. Our Hoyas have been outside all summer and enjoying it tremendously, rewarding us with some wonderful flowers. 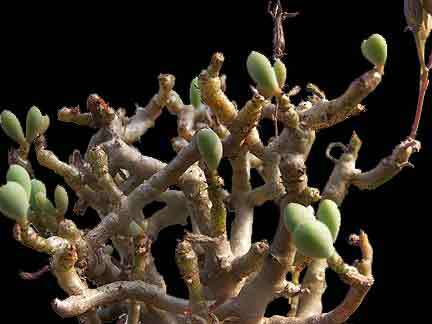 This on is the well-known variegated Hindu rope plant (Hoya compacta 'Regalis'). And for those who might have speculated about the origin of the name of the town of PeDee, Oregon ... speculate no more. An unincorporated community southwest of Monmouth, Oregon with a population of about 25, it was named by early settlers from the Southeast part of the U.S. for the PeeDee River, which was in turn named for the PeeDee Indian tribe. Now you know. For the last few days our deck has been decked out (the English language is such fun isn't it?) with some of our favorite flowers...but then we occasionally been accused of having weird tastes. Also known as the "Elephant's Tongue" or "Shaving Brush" plant from South Africa, this is an easy to grow succulent bulb which prefers moderate temperatures but bright light...and a weird taste for odd flowers! I don't know how it got its name and I'm not going to speculate. Anyone out there know? 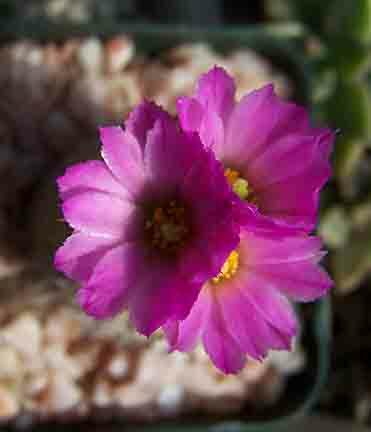 While the mesembs are doing their thing, off in one corner of the small greenhouse this Escobaria minima has been putting on a show for a week or so. 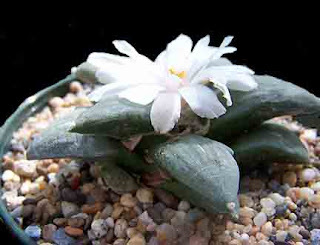 And for such a little plant, what a show! 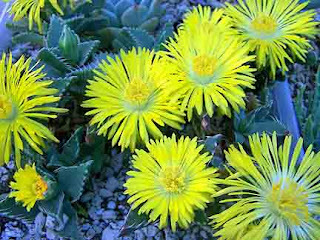 Another plant which is showing its colors is Faucaria tigrina. 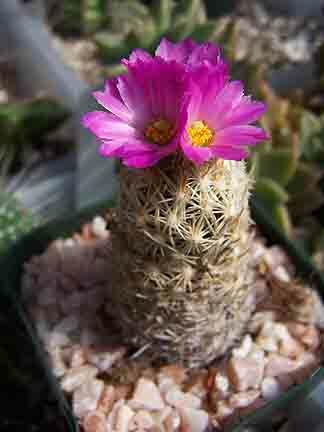 When it decides to flower it does so with style! 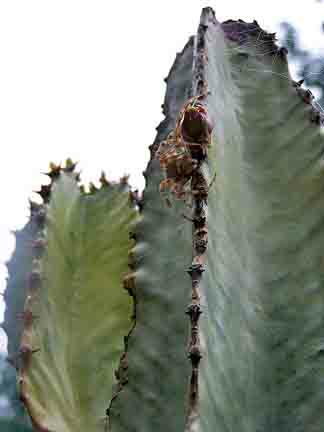 Between them, the Glottiphylums, and one lone Escobaria, the succulents were putting on quite a show today. 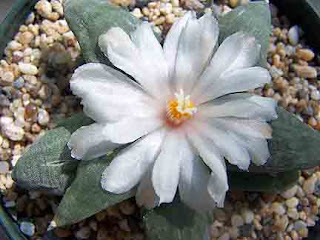 To me Ariocarpus is one of the most fascinating of cactus genera. 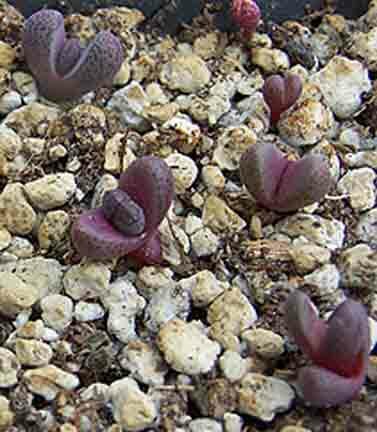 And though A. retusus isn't among the most rare of the group, it never loses its attraction to me. Last week it was blooming away, along with a beautiful blooming Lophophora diffusa nearby (not peyote [L. williamsii], which in the United States is illegal to possess!). Interesting things continue to happen every day in the greenhouses. It may begin to feel like it, but it isn't winter quite yet! 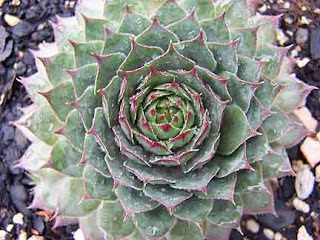 Another semp we've recently added to our supply is this gem: Sempervivum 'Red Beauty'. 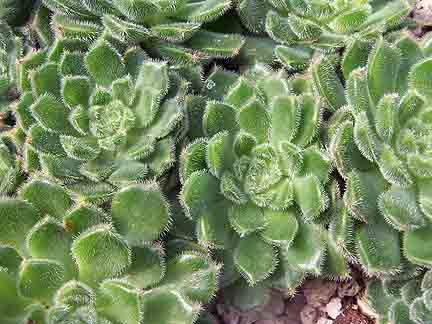 As with most sempervivums, the appearance can be quite variable, depending on the light and the soil. Ever since we bought plants from the late Helen Payne of Oak Hill Gardens near Dallas, Oregon (and author of Plant Jewels of the High Country), we've grown and enjoyed a wide variety of Semps. They're great plants with much more to offer than one would guess from their common name "Hens and Chicks". Some of the cultivars are really quite outstanding. This example is called 'Saturn'. In our area they're really quite easy to grow, though I understand that in some of the drier and hotter areas they can present a bit of a challenge. Being alpine plants they like good drainage and look their best when planted in a strata which isn't overly fertile. Another odd one. One has to be an artist to see the end result of growing this to maturity. It makes an impressive, small caudiciform plant fairly quickly. Perhaps the correct name should be 'Corderoyi' and it also goes under the old name 'Lipstick'. The proliferation of names added by various nurseries for the primary purpose of selling the plants makes it quite confusing. Many plants with different names will often look identical. 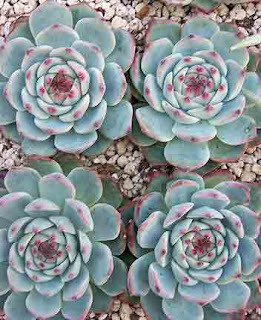 Whichever these are, they're outstanding plants. 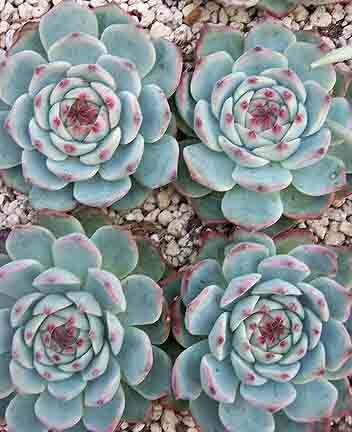 Their textured leaf surface and lovely symmetry made this a favorite for hybridizers. 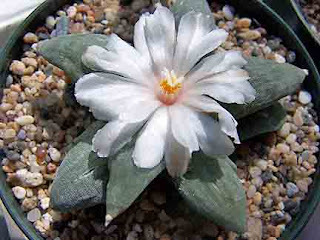 It's an outstanding plant in it's own right and though there are a few outstanding hybrids using this as one of the parents, this one deserves it's own place of honor. 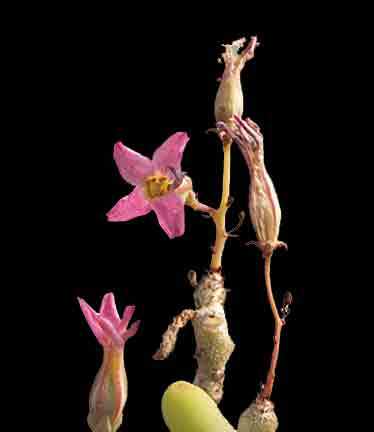 The science fiction flower for today is ... Fockea edulis! The species name - edulis - means edible, but I'm not about to cook up some Fockea soup. Parts are poisonous and the parts which I understand were eaten by native peoples were cooked first, to deactivate the alkaloids in the latex. Lynn-Marie felt I wasn't really clear when I wrote about Echeveria setosa var. 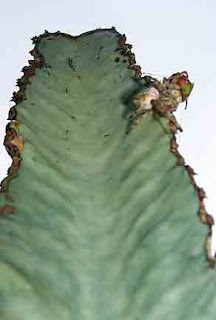 ciliata. I agree. I've made some changes in that post, but it probably still needs revision. Sorry. Our friend Linda Fink and we had a little fun recently about a photo she posted on her blog. I encourage you to visit it as her blogs are really quite good. Here's the photo of a load of manure which we said contained a face (actually two faces) and a hand. She couldn't see it until I drew a line pointing to it. Now she can't see it any other way. How about you? Can you see the manure monster??? "As with E. ciliata at the type locality, the plants of one population may differ so much among themselves that someone growing them side by side without knowing their com­mon origin might easily suppose they needed different botanical names. (For example, com­pare Figures 7 and 8 or 10 and 11.) From the taxonomist's viewpoint, of course, they do not— though the horticulturist might think some cultivar names appropriate." 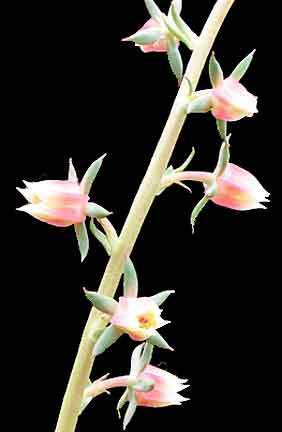 We received the plant below as Echeveria ciliata, but it doesn't really represent what most would consider to be E. setosa var. ciliata, as the surface of the leaves are more hirsute than one would expect. 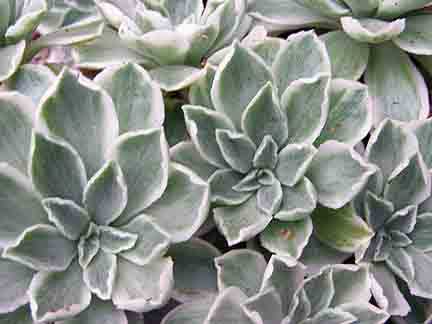 If I were selling it, I would label it Echeveria setosa and let the buyer decide which variety it belongs in. All of this may confuse more than help, and that's to be expected in such a variable species. 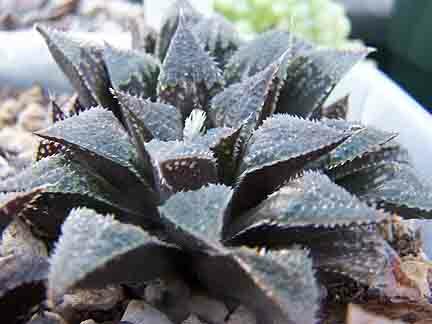 But for the collector the differences are clear enough for it to make sense to grow all the different forms, be they varieties or not. 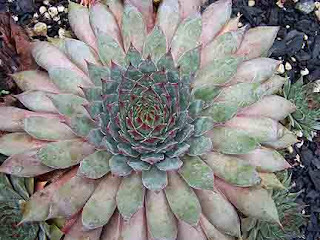 Echeveria setosa var. ciliata ? 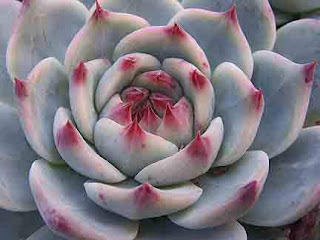 Echeveria nodulosa 'Painted Beauty' has some of the most beautiful flowers, especially when you get up close and personal. We have a few growing outside right now and they're putting on an amazing display. 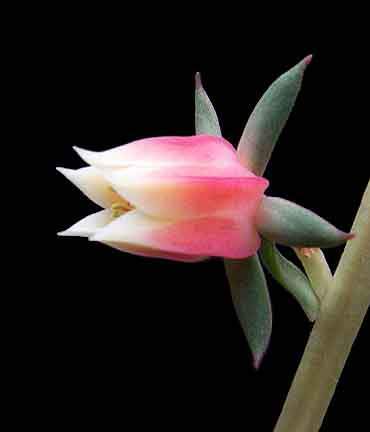 And though the flower looks like it's made of candy, it's very real. Time for a little break from all the plants. In case you aren't aware, Ladybug is one of our mascots here at Kara Nursery, and she knows how important she is. It was clear that Ladybug has been feeling a little left out recently and Lynn-Marie caught some of her "attitude" on camera. There are days that are like that. Not a very good picture because I had to enlarge it too much and it's a bit grainy. These are a few of the seedlings of 'Royal Flush' that have been doing very nicely this summer. They seem to be among the few who have really liked our cool summer days. Personally, I could use a little more warmth before we head into the long gray days of winter. Oh well, we'll get what we get. 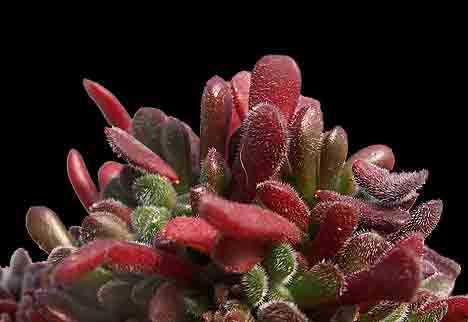 Also known as the Bear Paw Jade in some of its forms, this is a miniature plant which could be used as a ground cover in very mild climates. Personally, I like it in a pot just fine thank you! We first purchased this plant (actually, its ancestors) about 40 years ago and this is the name it had. I haven't been able to find such a name in the literature since then. 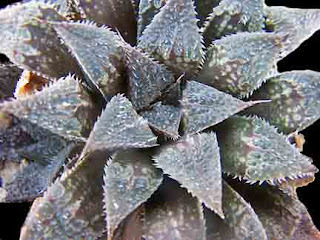 But it's a neat plant. It doesn't get very large and is easy to grow. 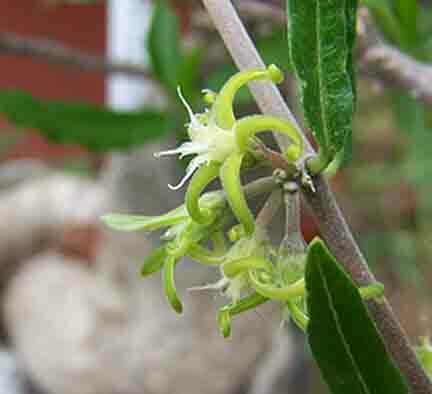 But it has one other characteristic which gives it a certain degree of uniqueness: Its leaves are sticky. Quite sticky. Obviously we like it or we wouldn't have had it around for 40 years! We have an eventful weekend coming up. We're going back to the Oregon State Fair again, this time to watch the Peruvian Paso Horses. Then on Monday (Labor Day in the U.S.) we're going to a horse ranch in Northern Idaho. I'll still try to get a few posts up.